I’ve been hinting at it for a while, but since we’re exactly a month away, I wanted to make it official! 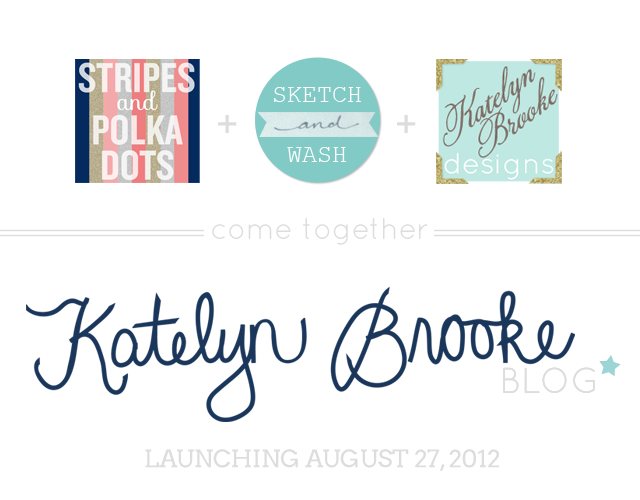 On August 27th, I’ll be launching new blog called Katelyn Brooke Blog. It will be a combination of my three blogs. I’ll be transferring the old content and everything, and I’ll be posting a combination of life and design posts, including some more sketchbook posts. I’m so excited to have everything in one place! I’m also going to give my website a little makeover to coordinate with the new look. I hope you’ll follow me over there when the time comes! I’m leaving for vacation tonight, but don’t worry- I have a week’s worth of posts lined up for next week! I loved having guest bloggers over Spring Break, I thought it would be fun to feature some more bloggers while I’m away. I hope you’ll come and show them some love while I’m gone! Loved the branding on this blog design. Check out the blogging pyramid. I need to make an “I don’t” list. A media kit is also on my to-do list! Yay! Can't wait to see the new site. Also, have a wonderful time on vacation (I'll email you about Alt when you're back so it doesn't get lost in the inbox). I can't wait to see your new site Kate! Have a wonderful time on vacation, you certainly deserve a break from all the hard work! I am so stinking excited for your new blog! I think it is really going to help you focus all of your talents and gifts in one place. Hurry up August 27th! Have fun on your vacation. Also thank you for mentioning my post, you're too sweet to me. So excited for you!! Can't wait to see the new site. Enjoy your vacation!! Congratulations!!! That's so exciting! Have a great vacation girl. You deserve a break! I'm so excited for you, Kate! I just know that streamlining and condensing everything will make blogging so much easier for you! I can't wait to see it! How exciting! Looking forward to seeing it. Have a great vacation! Can't wait to see the new blog! Have fun on vacation! Congratulations!! So excited to see all the old, but also what other things you have to offer! Great links this week! I am so excited for your new site to launch next month :) Have fun in NYC! So cool…. I can't wait to see the new site when it's completed! Also, I hope you are having an awesome vacation!